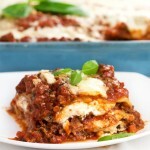 A delicious recipe for lasagna with meat sauce and three cheeses. Cook the Noodles: Bring a large pot of water to a boil. Add 1 tablespoon olive oil and 1 teaspoon of salt to the water. Lower the lasagna noodles into the pot one at a time so they’re less likely to stick together. Cook until al dente, per package instructions, stirring often with a wooden spoon to separate noodles. Drain noodles, run some cool water over them, and lay them out on a sheet pan. Cover with a damp dish towel. Make the Meat Sauce: Add 1/3 cup olive oil, chopped garlic, and crushed red pepper to a large pot or Dutch oven. Set the heat to medium. Cook until the garlic gets fragrant and sizzles a bit, 30 seconds to a minute. Pour in the tomatoes carefully because they might sputter (see note about tomatoes). Add dried basil and wine. Bring the sauce to a boil. Lower to a simmer and cook for 15 minutes. Use an immersion blender to crush the tomatoes in the pot. Simmer the sauce for another 30 minutes or so, adding cooked meat and vegetables in as they are ready. Sauté Meat and Vegetables: While the sauce is simmering, heat 1 teaspoon oil in a large skillet over medium-high heat. Cook beef and sausages until they lose all their pink color and start to brown, breaking up the large pieces with a wooden spoon or metal spatula. Sprinkle with a few pinches of salt and a few grinds of black pepper. With a slotted spoon, transfer meat to the sauce. Caramelize the Vegetables: In the same skillet, pour out all the fat and add 2 tablespoon of olive oil and the carrots and mushrooms. Cook, over medium heat, for 12-15 minutes, stirring frequently and pressing them down into the pan with the back of a spatula, until they’re lightly browned and caramelized. Sprinkle with a little salt and pepper and add them to the sauce. Assemble the Lasagna: Preheat the oven to 375ºF and set the oven rack in the center position. Spread 1 cup of sauce over the bottom of the casserole. Arrange a layer of 4-5 noodles on top. Cover with 1/3 of the sauce. Sprinkle on 1/3 of the mozzarella. Spoon 1/2 of the ricotta around evenly, in little blobs. Sprinkle on 1/3 of the parmigiana cheese. Repeat with a second layer of noodles, half the remaining sauce, half the remaining mozzarella, the rest of the ricotta, half of the remaining parmigiana. Add the final layer of noodles, the rest of the sauce, the rest of the mozzarella and parmigiana. Cover the casserole tightly with a double layer of foil but try to tent it a bit so the foil doesn’t touch the top layer of cheese. Cook for 40 minutes. Remove the foil and cook for 10-15 minutes more, until the sauce is bubbly and the cheese is melted. Let the lasagna rest for 15-20 minutes. Slice and serve. Sprinkle with fresh basil, if you like. *A note about tomatoes: If you don’t have an immersion blender, you’ll need to break up the tomatoes in a blender or by hand before adding them to the pot. If you don’t have an immersion blender you’ll need to puree the tomatoes or break them up by hand before adding them to the sauce.